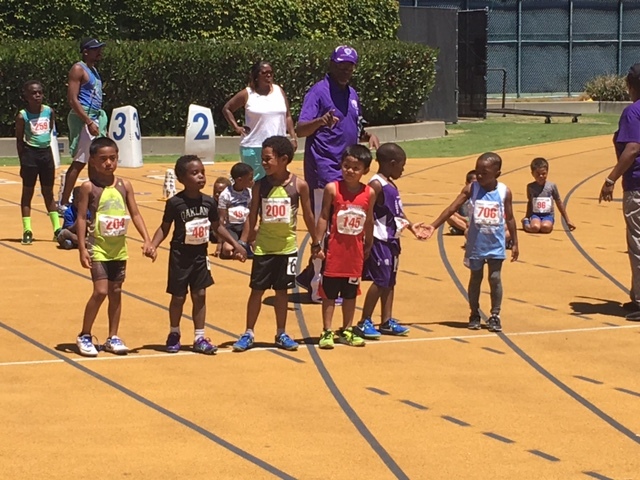 Last weekend my 4-year old son competed in his very first-ever track meet. 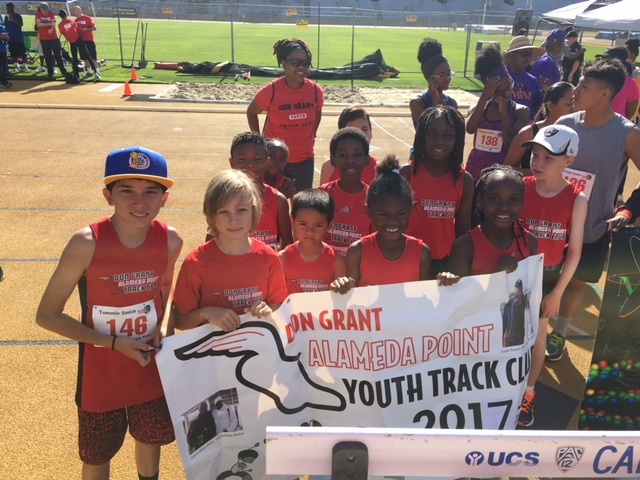 A few months ago, I heard about a local youth track team (Don Grant Alameda Point Track Club), where we live, and after one practice, both my boys decided they wanted to be part of it. 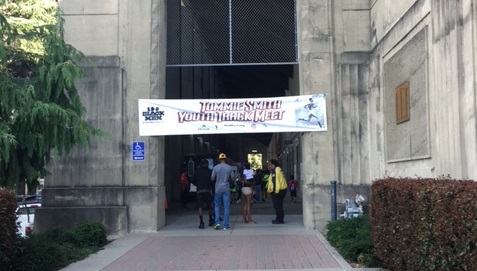 So, when it came time to register for the 2017 Tommie Smith Youth Track Meet, which would be held at Edwards Stadium at U.C. Berkeley, we signed up! Being as my boys are still young, there were just a couple events they could register for. 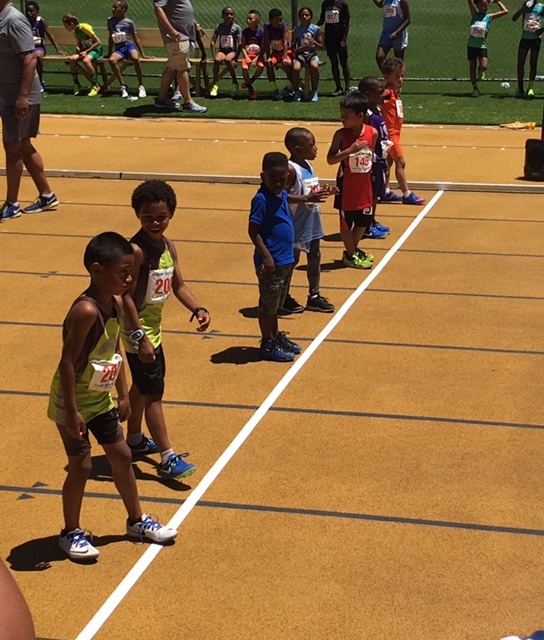 The Long Jump and a 5oM for kids ages 6 years and younger. And although I signed them both up, only my older son wanted to participate and he just wanted to run! When we arrived, we didn’t know what to expect, but it was nice to join the other teams doing a “parade” before the competition started. 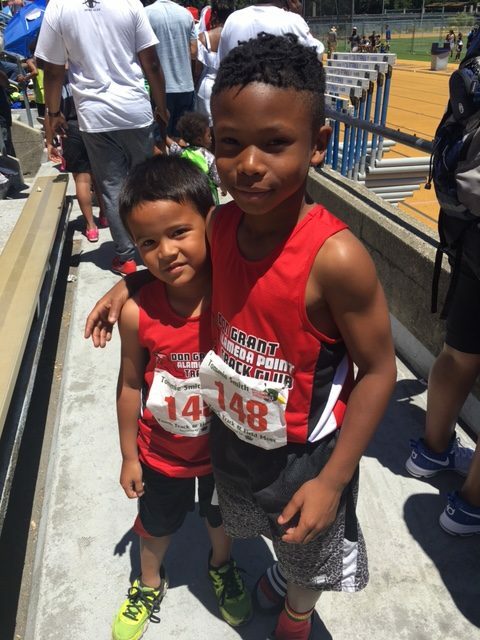 Even though the kids compete individually, we were fortunate to find a great group that is very supportive of each other and they have lots of fun. As if I needed to add any more “crazy” to our life, once we saw the lineup of events and figured that Raef’s 50M wouldn’t run until around or after lunch time, I decided we should take a break from the meet and head to his swim lesson that wasn’t too far, and the other Moms kept me posted on what events were being run while we were gone. At any rate, when Raef’s swim class was ending, I got word that his would be coming up soon and so we literally sprinted (safely) back to the stadium, where I doubled parked to get him checked in for his race..before finding real parking and making it back inside to see my first-born take to the track. 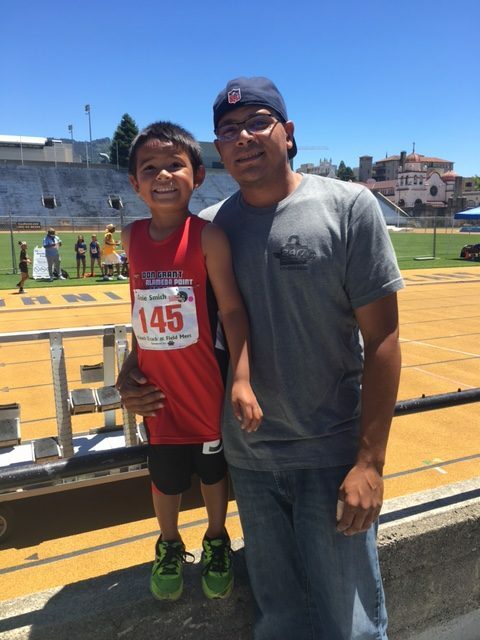 *Side note – not doing that “supermom” stuff again, I was stressed trying to get him to his race and we cut it close…by the time I sat down, I had done a race of my own! lol! 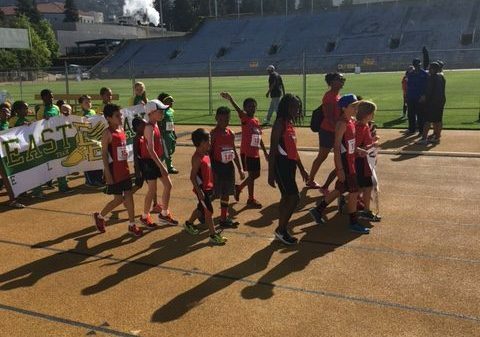 When it came time to lineup, organizers placed the kids in order and had them join hands to walk to the starting line. I think we were more nervous than our son! We had tried to give him advice about listening for the starting gun, and just running his best race, no need to look around, but just focus! It would have been wonderful if he placed, but we think he had an even more valuable lesson, which is to keep going and finish…NO MATTER WHAT! And, now that he knows how it all works and what to expect, he has a much better perspective moving forward. All in all, it was a very successful outing and with his Dad and one of his favorite track teammates giving him the congrats for a job well done, we left with lots of smiles!